The Rejuvapen by Refine USA is a medical grade, state of the art precision tool available through skincare professionals only. They have coined the term “Fractional Collagen Induction Therapy”™. It is a FDA Registered Class I Medical Device indicated for the treatment of aging skin and scaring. Rejuvapen provides your patients with an alternative to laser resurfacing with impressive results and little or no downtime. It is versatile, easy to use and has high patient satisfaction. Fractional Collagen Induction Therapy™ is designed to address acne scars, hyperpigmentation, stretchmarks, skin texture as well as, fine lines and wrinkles by stimulating the skin’s natural ability to produce new collagen formation creating healthier skin. Patients are pink from 2-4 days and feel mildly “windburned for less than 24 hours. Very little down time. Healing time depends on the severity of damaged skin, however, on average. 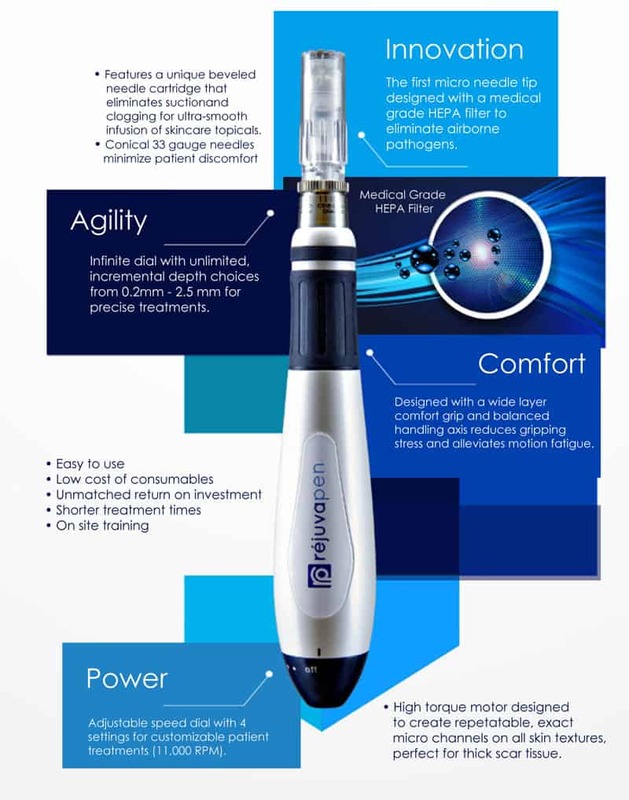 Unique design of Rejuvapen allows for individualized settings making the treatments comfortable for all skin types.Only the Rejuvapen features a unique beveled needle cartridge that eliminates suction and clogging for ultra-smooth infusion of medical skincare topicals. This scalloped tip allows the cartridge to glide through serums without collecting on the inside of the cartridge.